Remember the “He-Man Woman Haters” club? How about romantic Alfalfa, adorable Spanky and lovely Darla? Sounds familiar, eh. Today’s party will bring us back to the old school charm of neighborhood clubs, tree houses, and the never ending Girls versus Boys. Styled by the talented ladies of Luxe Parties and organized by Party Planners Plus, Caleb’s The Little Rascals themed party sure is extraordinary! (Click here to know more about The Little Rascals Movie). Gladys and Cherissa did an awe-inspiring full production set at the venue! The décors at the stage area were stunning – there’s the tree house replica, lemonade stand and the lavish candy shoppe cart! Fun Fact: Caleb has an allergy with balloons so they used kites instead for the ceiling. The venue was divided into several areas. Guests were treated with lots of fun activities wherever they wish to hangout. For the pool area, guests can design their own flipflops! They also gave out these fluffy towels for those who wanted to swim. The parents were treated with some yummy frappes and overflowing snacks as they chitchat at the Parents Lounge. The kids “clubhouse” is where all the happening took place – there’s Pink Box kiddie spa & salon, arts & crafts area and the Personalized stuffed keychain to keep the little rascals entertained. For the program, they opted to have a Mad Science program instead of the usual magic shows. Caleb’s sweet treat spread is a stunner! I love the burger inspired pie, popcorn cupcake, ice cream cupcake and his treehouse cake! Serious eyecandy overload here. Here are more photos of the awesome party details. I can’t help but notice the relaxing “backyard” type ambiance they were able to recreate. To make the party more exciting, Mommy Christine and Daddy Jim raffled off a Play House and Wii to 2 lucky kids! Caleb sure is one happy baby! Just look at those chubby cheeks! 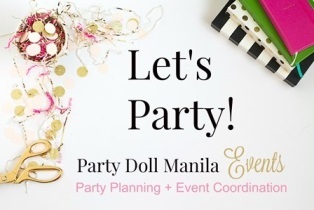 Coordinators – Planners Plus Events Co.
Ei! how much for the frappe shoppe thanks! All the kids should enjoy with this theme even those kids at heart, ang ganda talaga. Caleb’s variety of different materials for the kids are very amazing offering at the most. Nice! It’s beautiful from the setting, decoration and food. The entire look of it is very well arranged. Indeed one grand birthday celebration, Caleb is such a happy and adorable kid, so lucky to have this wonderful birthday party with his family and friends. In fairness i love the decor and the theme as well as the setting….bravo!!! That was really a great and well organize party. I’m sure that all kids enjoyed that beautiful theme, nice decorations and food. Lots of activities for kids and parents. I hope I can give my daughter such kind of party. Such cute theme and event well organized! I am really impressed by how Filipinos do their parties these days! Very chic! Wow, that’s a fantastic themed party. There are plenty of things to do. I can imagine how happy the celebrant and all the guests. OMG! I was to be a kid again. LOL. That’s such a dream land for our kids. It’s something that will make them smile for sure even when they grow old. Wow! nice party idea, but how much will it cost one? What a fabulous theme and way to celebrate the very first! Wow! Super grand celebration! Everybody looked like the moment was so full of fun! How wonderful! Another great themed party. I would want a party like this, with swimming involved. And I cannot believe this is in Malabon. Awe! What an awesome and fun party. Love everything about it and it tickled me when I read the “Girls Have No Sense Of Direction”. Reminds me everytime my family and I go on vacation and I get lost reading the map. LOL! Love it! I love everything that this party have. very cute and unique. You guys got me with the “rattan” car. Still, the whole clubhouse Little Rascals feel takes me back a long way. Did you know that Jackie Cooper, one of the kids in the old serials, later became a drama actor? He played perry white in the Christopher Reeve Superman movies. Very neat! Love the colors and the minute details. Actually, I like all that I’m seeing here, even the documentation, great takes!